phpGuard PRO is a product that will protect your site from hackers and attacks. It could protect your site from SQLi (SQL Injection), Mass Requests (DDoS), XSS, Proxy, Spammers, Malicious Files (Shells) and other types of threats. Each attack is logged in the database (No Duplicates). 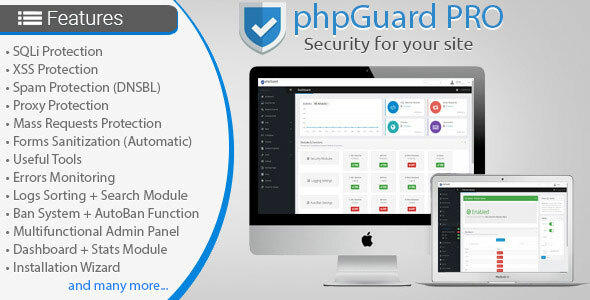 phpGuard PRO comes with powerful admin panel, from which you can view all logs and he is also integrated with Ban system from which can be viewed and banned users and countries. The Admin Panel has many features and settings. Through it can be easily managed the whole phpGuard PRO, as well as all of its modules and functions.